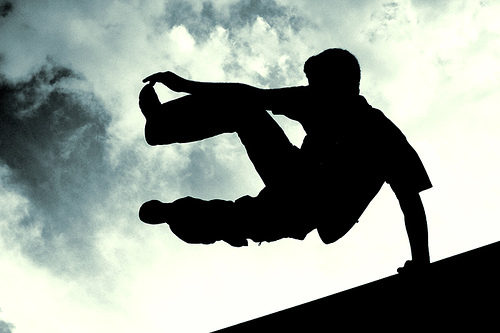 Parkour – a great way to get moving! A belated Happy New Year to everyone from Mudlife Crisis! I hope everything has started off well for you and you’re sticking to your goals and resolutions. I, for one, have gotten one of my resolutions off to a great start, and I’m doing it with a new trainer and 614 Parkour. 614 Parkour is where certified Parkour coach Theo Gorman teaches the youth and adults of central Ohio in the art du déplacement. Theo has been teaching Parkour since 2011, when he earned his Art du Deplacement and Parkour Teaching Certification. He’s also has EMT, MovNat Level 1 and 2 certs, and is certified with the NASM as a personal trainer and a corrective exercise specialist. So he’s definitely got the chops. I met Theo at the Columbus Paleo Meetup that he organized last month, and was pleased to hear that he was doing classes locally for adults. When he announced a new term for his classes the other day, I jumped at it. So Saturday afternoon, I headed over to the Whetstone Recreation Center near our house in Columbus and got ready to do my first ever Parkour training session. I was a little bit nervous – one hits 50 and you start to question whether you should be doing such stuff. Plus, I’d must played a water polo game with my wife’s swim team (parents vs. swimmers) and even though it was fun and friendly, I was sore from using a whole lot of muscles I hadn’t used it quite a while. Watching Theo training the kids’ class that was just before ours, you could see that the kids were listening to him and he was keeping them having a fun time. But they were also clearly understanding the movements that he was getting across to them. They were all attentive during the portion of the class that you frequently see kids fading out in… stretching. To me, that says a lot. As the class let out and we moved in to start, we began with a request from Theo that I totally appreciated: shoes and socks off, we’re going barefoot! Shoes came off and we headed over to the training area to begin. The training area was padded and had good traction, a great way to start with a new paradigm in training. There’s a certain comfort level in seeing those little amenities. Theo’s training methodology was great. Everything we did started simple and worked in progressions into more difficult stuff. Somersaults led to somersaults from a knee, which led to side somersaults from a knee. Side balancing on a beam led to squats on a beam, which led to the MovNat tripod transitions. And then tripod transitions led into controlled side vaults over a waist-high pad. Theo’s use of terminology I know fairly well already via his MovNat training was very helpful – he was able to communicate very clearly why things should work a certain way. And there was always an emphasis on efficiency of movement. Parkour is not free-running, where flash and tricks are more the rule… Parkour is about getting from A to B with efficiency and speed. It’s a philosophy of not being ruled by your environment, but working within your environment to go where you want to go. And it was clear that the training we were doing was showing us how to do just that. One skill we worked was that of planting a foot on vertical surface (a wall, etc.) and using our momentum to push up (to gain the top of the wall), or turn and redirect that momentum elsewhere. You can completely see how such work would be useful in the real world – escaping from an attacker, going over a wall in an obstacle course race, crossing a stream over rocks, the sky’s the limit (literally, in some cases). I was in complete appreciation of this. The efficiency of movement and motion is going to enhance my obstacle completion and even just the aspects of covering diverse terrain in an OCR. And of course, the non-muscle-specific training that full-body movement affords will be helpful in injury prevention, which as we age becomes more important. It’s even more important to non-physical workers such as me – sitting at a desk hammering on keyboard isn’t the most full-body activity. The other thing I gained from the day’s training was a recollection of what I need to work on to make sure I can handle such training. Some of the falls from even three feet or so reminded me that my knees and especially my ankles haven’t had that sort of impact for a while. It’ll be great impetus to make sure that work on those two joints (some jumping and landing drills done regularly, for example) get back into my personal routine. As my schedule isn’t going to allow for structured training during the week, it’s going to fall to me to keep up with the maintenance-type work. So… it was a successful day. I got back into a movement routine that interests me, I got to try some stuff I’ve wanted to do for a long time, and I got great training from a qualified instructor whose goals mirror mine. In the whole “don’t die till you’re ready” world, trying Parkour at age 50 is a big win. This is exactly the sort of activity that the human body needs and should practice regularly. It’s evolutionary, instinctual, and heck… it’s super fun! If you’re interested in trying out some training yourself, come join us on Saturdays at 2:00 at Whetstone Recreation Center in Columbus, and follow 614 Parkour on Facebook!